Puzzle solving is a more active type of learning and will better engage students with the Chinese words compared to passive types of review techniques. 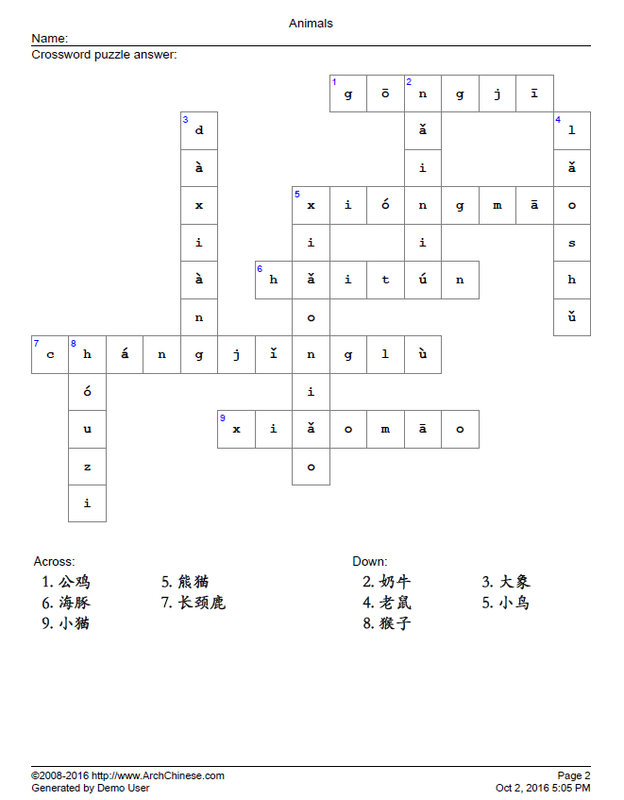 This tool allows you to create customizable pinyin crossword puzzles based on the Chinese words that you are teaching or learning. It is recommended to use compound words, not single characters, to create the crossword puzzles because the pinyin of single characters could be too short to create a typical crossword puzzle. Like other Arch Chinese tools, you can simply load a vocab list and hit the Print button to generate a crossword puzzle. If the vocab list has many entries, only ten of the words will be used. The system may also insert a random word from the Chinese-English dictionary to make it possible to create a crossword puzzle. 5. Use random words from the Chinese-English dictionary if needed. Enter the Chinese characters or words. You can copy or paste Chinese text from other sources, such as web pages or word documents, or enter them using your faovorite Chinese Input Method Editor(IME). Both simplified and traditional Chinese characters are supported. Enter the definition of the Chinese character or word. You can click the E button to let the system fill in the definition for you if the Chinese is a single character or a commonly-used word. Click the P button to add Pinyin automatically. In the case that there are multiple pronunciations for a particular character, the system will attempt to use the right one based on its context. In some cases, the user may have to edit it. Do not use punctuation marks in the Pinyin input box. Note that Pinyin must be entered with tone numbers. The system will convert them to tone marks when the puzzle PDF is generated. In addition, the Pinyin syllables must be separated by a blank space. As an example, for the Chinese word 哪儿, the Pinyin must be entered as na3 er2. Use v for ü, for example lv3 for lǚ, and number 5 for the neutral tone, e.g. ma5 (吗). Go to the option section to adjust the settings accordingly. 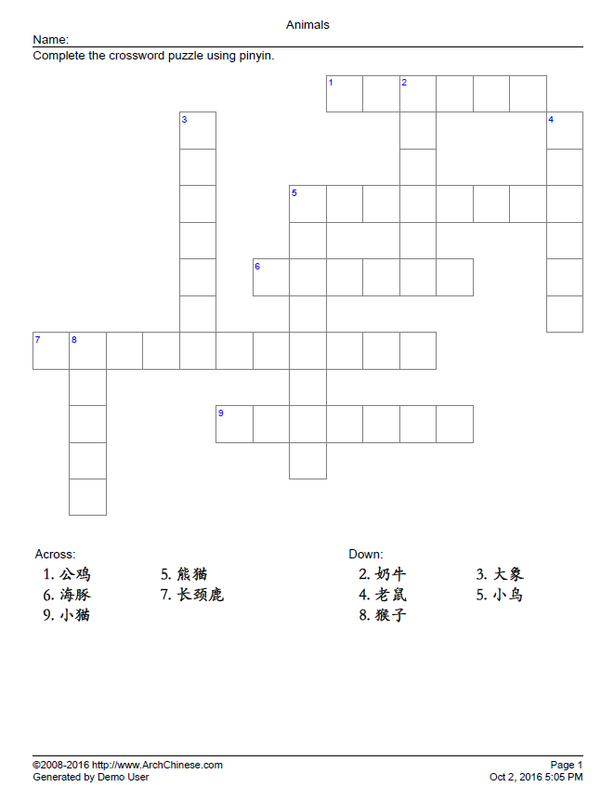 Click the Print button to generate the Pinyin crossword puzzle sheet. When you click the Print button again, the generated puzzle will be different.